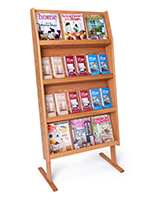 Why are book stands necessary displays for bookstores and daycare centers? Organization! 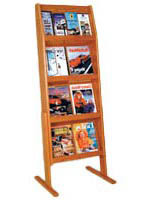 Retailers should always ensure that their periodicals, paperbacks, and children's stories are properly organized with the right book rack. 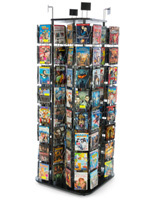 Customers, including kids, are much more likely to make a selection from an orderly shelf than a messy one! 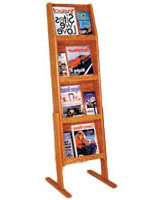 These book racks come in many styles, from simple economy wire bookstore furniture to upscale hardwood birch systems. 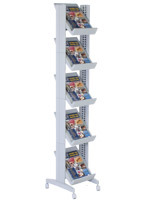 This way, it is easy to find the bookshelves that will be most effective in your application whether you operate a national bookstore chain or run a local childcare center. 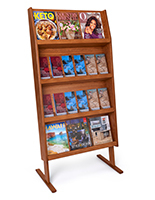 What are the different types of library & bookstore furniture that are currently offered? 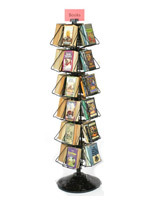 Book stands are sold in a variety of designs but primarily feature wire, metal, or wooden construction. Each of the bookshelves has it advantages. 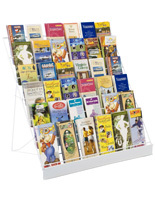 Kids' literature stores are ideal for our line of wooden shelving. 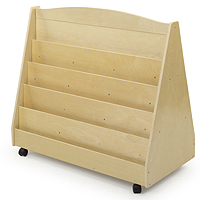 These natural birch daycare shelves feature small designs that make it easy for children to grab the stories they want. 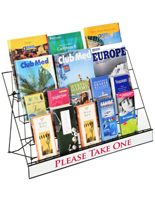 Some of the literature display stands are equipped with simple shelving, while others offer unique cubbies and storage bins. 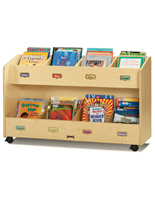 There is even a cart with wheels that makes it easy to transport children's literature from one preschool classroom to the next. 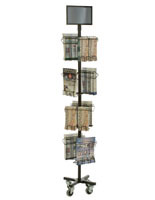 Choose from both storage bookshelves and units for tiered display areas. 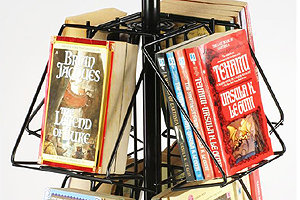 Wire bookshelves are an excellent choice for merchants, rather than libraries or kids' classrooms. 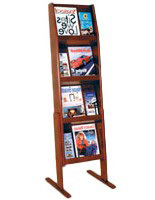 This bookstore furniture is great for retail sales applications because the economy price points make them very affordable. 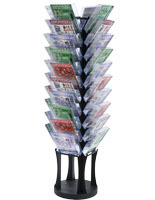 In fact, many retailers purchase them in bulk to outfit their whole bookstore or even several stores. 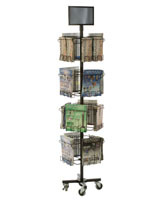 The advantage is that the more units a customer buys, the cheaper the individual unit becomes. Another trait to consider is a rotating design. 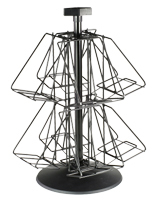 Many of these wire options have spinning, or revolving, assemblies that maximize viewing area while saving space. 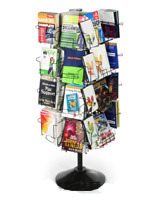 Metal book display shelves are another great option for the retail sales sector. 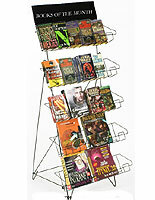 Most of these literature racks could be used in a library or children's classroom, but are better suited for merchants. These are some of the most versatile because many offer height adjustability. 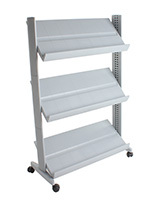 Certain units even allow for the shelving to be tilted to the optimal display angle. 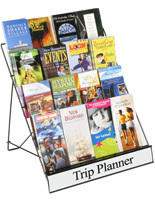 Literature storage bins, push-along carts, and traditional retail sales racks are all great tools for a variety of uses. 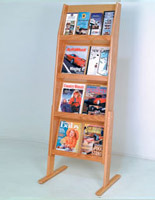 The wooden storage furniture is helpful because they shelving can usually accommodate more than just books. Many kids like a cuddly stuffed animal during storytime, and that's just one of the many items that could be stored on the racks. 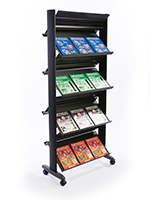 Push carts are great because they allow library collections to be shared throughout multiple classrooms. Schools are frequently limited on resources, and sharing books provides an excellent way to cut collective costs. Some of the book carts are double-sided, so they offer all kinds of storage. 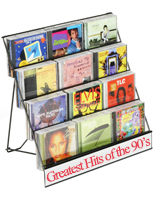 Even some of the metal stands features built-in wheels on the bases. 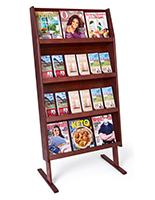 In many cases, the shelves on these units can be faced opposite directions. 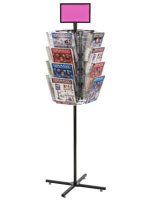 This type of setup is great for maximizing your book display area. 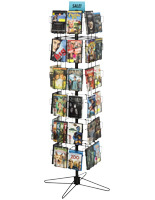 Wire racks are pretty standard and are most used for retail sales. 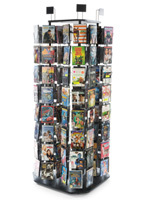 We carry flush-wall units as well as rotating racks that save space on floors and counters. 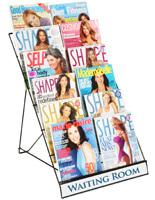 Imagine the space you would save if your customers could browse from a single vantage point! 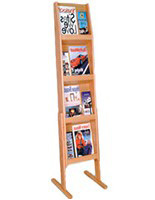 As you may have already figured out, choosing the right bookstore furniture can be tricky. Not only should the customer consider features, like number of shelves or what material is used for construction, but also price is a very important factor. 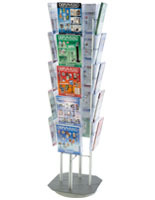 We all know that everyone likes a low price, but rolling out effective displays on a larger scale while saving money is where BrochureHoldersNow comes in. 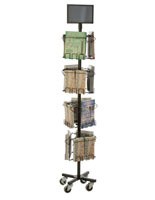 We offer competitive bulk pricing that allows both small businesses and large corporations to order the quantities they need while reducing the cost per unit.